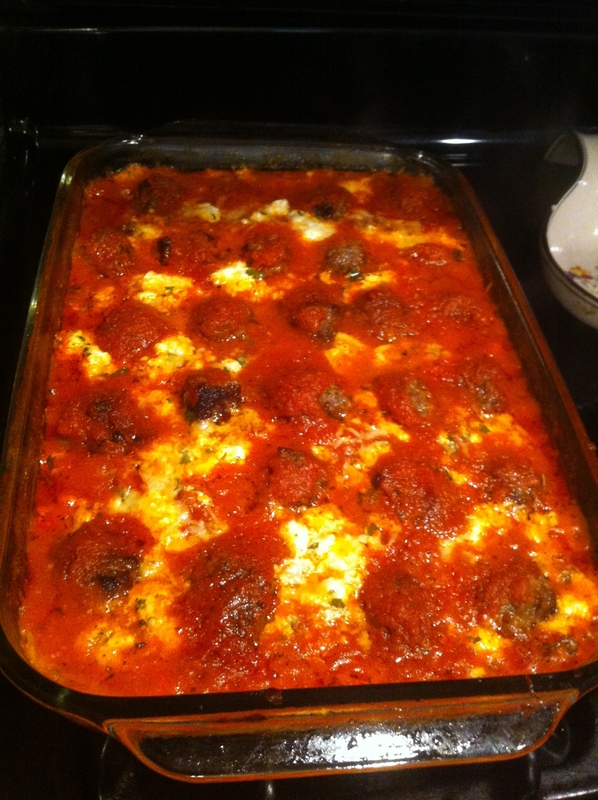 I decided to do a lasagna using veggies instead of noodles and then topping it with some savory meatballs. The result was a yummy italian casserole and my kids didn’t even know there were veggies inside. I also made some homemade ricotta to go inside which was fabulous! I will share that recipe with you later. Lay eggplant and zucchini slices on a kitchen towel and sprinkle with salt. Let drain for 30 minutes. Pat veggies dry and brush with olive oil and roast in 400F oven for 6-10 minutes until slightly golden. Combine beef, pork, granulated garlic, salt, pepper, parmesan cheese and breadcrumbs in a large bowl. Form into meatballs and then brown in a large stockpot with some 2 T olive oil. Once all sides are browned remove meatballs to plate to drain on papertowel. Combine pasta sauce, diced tomatoes, sugar and salt and pepper in saucepan. Using hand blender puree until smooth and heat just until warm. Combine ricotta with 1c of cheese, the mozzarella, parsley, egg, salt and pepper. Mix to combine. Lower oven to 400F and spread 1c of sauce in bottom of 9X12 baking dish. Layer in eggplant and zucchini and then cover with some of ricotta mixture. Layer with potatoes and then top with salt, pepper and half of the chopped herbs. Repeat layers and then top with meatballs and some additional sauce. Cover with foil and bake for 40 minutes. Let cool for 15 minutes before serving.